This scroll is going back East. 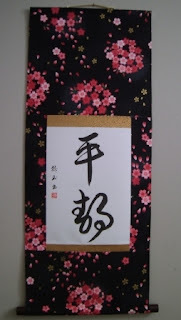 It was ordered through my online shop, with a black cherry blossom cloth. The writing is Serenity in Japanese full cursive calligraphy. (Sousho) I enjoyed making this scroll for the customer. It is completed with Rosewood Jikusaki and Usukincha (Light gold) hanging string.